Capsicum and cashew rice is a delicious rice. This less spicy rice is my favourite. I learnt the procedure from mom but made few changes to her original recipe. You can prepare it easily within short time with less effort. 1. Heat oil in a pan. Add bay leaf and cinnamon. Fry for few seconds. Medium the flame. 2. Add onion, green chillies and capsicum. Fry well. Now add cashew and fry for few minutes. 3. Then add the washed rice. Fry for sometime. 4. Transfer to rice cooker. Add coconut milk, water and salt. 5. Mix well. Cook the rice. 6. Once cooking is done, garnish with coriander. 7. Serve hot with any spicy kurma or gravy. That sounds really good! I will keep it in mind the next time I am making Indian food. Thanks for sharing your recipe. Nice rice dish with minimal ingredients. Loved the presenatation. Yummy cashew capsicum rice Nithu, very easy and looks great ..
Love the aroma of the bell pepper nithu.Delectable rice n wonderful presentation. Super yummy rice..nicely presented.nice recipe dear. Such a delicious rice dish! Wonderful presentation and yummy rice. Never tried it at home but my friends prepare it during potlucks and I love the taste !! Thanks a ton for the entry Nithu !!! ரொம்ப சுலபமா இருக்கு... உங்களது குறிப்பு!Thanks for Sharing! simple and easy to make rice. 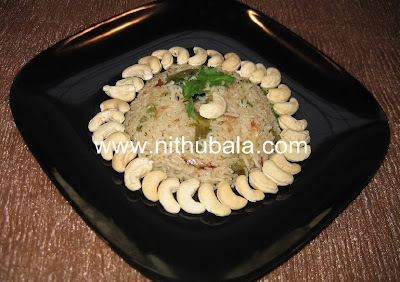 Love your presentation..
Beautiful and tempting rice, my fav combo..
Love this rice. Sounds so good. YUM! Thats a really tempting rice..
With cashew and coconut milk,should be so tasty and yumm! Simple and delicious looking, nice combo...looks so yummy. Rice looks yummy. My kids are sure to relish it. Cashew and coconut mil a nice rich combo. Lovely should have tasted yum.